There's much that can be managed and controlled in hosting a kilt skate -- cake, hot chocolate, entertainment, swag. What lies beyond our control, of course, is the weather. As Rabbie Burns might have said, "The best-laid plans of mice and kilt skater gang aft agley." 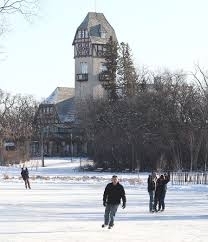 With temperatures forecast to remain above freezing for this weekend's winter festival in Winnipeg, the Scottish Council of Manitoba reluctantly cancelled what was hoped to be the first-ever Sir John A's Great Canadian Kilt Skate on a duck pond. Two years ago, Winnipegers showed how tough and resilient they were -- showing up in great numbers for the First Annual Sir John A's, which was held at The Forks on the Red River Mutual Trail -- which boasts itself the world's longest skating rink. 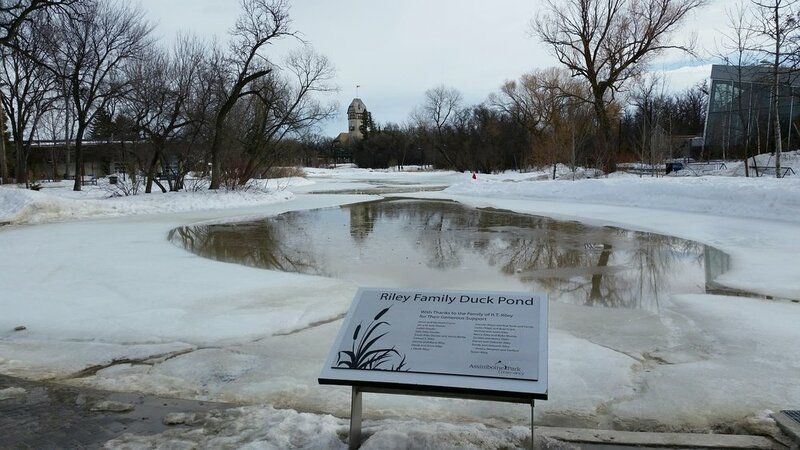 This year, the organizers arranged to host the event at the Riley Family Duck Pond at Assiniboine Park, on Sunday, February 19. Birthday cake and hot chocolate would be available in the Tamarack Room in the Qualico Family Centre at 3 p.m. But this weekend's warm temperatures mean that the pond will be closed for the season. John Perrin of the Scottish Heritage Council of Manitoba says that they will be looking at ways to host the event again in 2018. The Council is an incorporated non-profit association of twenty Canadian-Scottish heritage and cultural organizations in the province of Manitoba. The Winnipeg kilt skate was going to wrap up the 2017 season. It's too bad that the season ended without a grand finale at the Riley Family Duck Pond, but we have confidence that winter will return next year, and with it a new season to celebrate Sir John A. with bare knees and ice. As a post-script, here are pictures that John Perrin sent of the Riley Family Duck Pond on the day the kilt skate was scheduled.